Glass, a former Middle East correspondent for ABC News, who has written extensively about the use of chemical weapons, said there has been great inconsistency in Western policies on this issue, pointing out that the US favoured the use of chemical weapons by Saddam Hussein during the Iran-Iraq war, causing the deaths of thousands of Iranian soldiers. The British government responded to the news of a deadly Saudi-coalition strike on a wedding in Yemen last week by saying that its “heart goes out” to all those affected. It refused, however, to halt arms sales to the country, accepting the word of the Saudi government that the attack would be investigated. Almost 100 people, including men, women and children were killed or injured in the strike. Albukhaiti contrasted the muted reaction to the rash response of the alleged chemical attack in Syria. 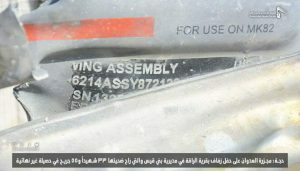 The journalist said he has proof that US-made bombs were used in the wedding party strike, posting a photo of a fragment of an MK82 bomb found in the area. 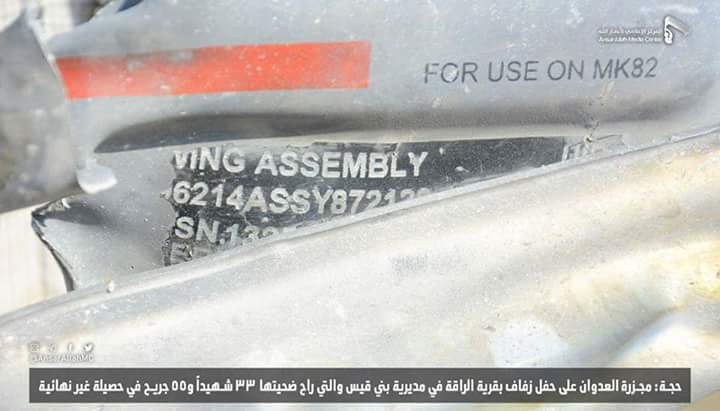 It was a #US made bombs type MK82 ??? Albukhaiti claimed that there are cluster bombs everywhere in Sa’dah and presented an example on the air of a US-made cluster bomb given to him by the children who found it in a village in east Sa’dah. In 2016, Saudi Arabia admitted that it used UK-manufactured cluster bombs against Houthi rebels in Yemen. Prior to the revelation, Britain denied their cluster munitions were being used by the Saudi-led coalition. The British government now denies selling cluster bombs to the Saudis.